To offload work from your MATLAB® session to run in the background in another session, you can use the batch command inside a script. batch runs your code on a local worker or a cluster worker, but does not require a parallel pool. You can use batch to run either scripts or functions. For more details, see the batch reference page. You can combine the abilities to offload a job and run a loop in a parallel pool. This example combines the two to create a simple batch parfor-loop. This command specifies that three workers (in addition to the one running the batch script) are to evaluate the loop iterations. Therefore, this example uses a total of four local workers, including the one worker running the batch script. Altogether, there are five MATLAB sessions involved, as shown in the following diagram. 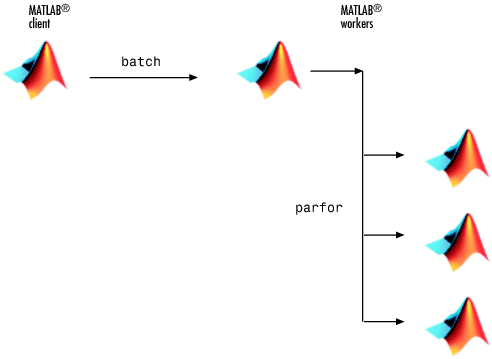 The work of defining the parfor-loop and accumulating its results are offloaded to another MATLAB session by batch. The loop iterations are distributed from one MATLAB worker to another set of workers running simultaneously ('Pool' and parfor), so the loop might run faster than having only one worker execute it.